The Rogue Festival in Fresno is one of the largest and most successful Fringe-style festival west of the Mississippi! It includes a blend of performing artists with an indie edge that makes for an exciting 10 days of new theater, music and dance. I have seen over 11 shows with two days two go. Most are great, some are excellent, and only a couple have been sub-par. Last year the festival had a number of dance and movement based performances, this year there were only three concert dance works. Here is my review of two of them, Fresno Dance Collective (NOCO) and Juxtaposition Dance Theatre with a bonus review of a theater sketch comedy duo If and When. I encourage the LA dance community to consider attending this festival in the future as it is a great opportunity to see excellent artists pushing the envelope of art and performance in a festival environment. Founded by Amy Querin, Fresno Dance Collective presented Acts of Affordable Care as a commentary on the nature of care, caring for, and being taken care of by others. A mix of release-based modern dance and aerial silk choreography, Querin and company succeeded in striking a delicate balance between the two movement forms. This is particularly challenging as aerial silk work can easily dominate the modern dance occurring below. The silk choreography integrated easily into the themes of care and support, dancers were cradled, supported and caught by the silks in innovative and intriguing ways. Each interaction fostered a new perspective on care and how we relate to care and support. The modern dance portions of the show included full stages with multiple dancers or pairs of dancers performing simultaneously. The addition of aerial work on top was a bit much at times, making it difficult to take everything in at once. I much appreciated the simple moments in which just a few dancers were featured at a time, and I was able to soak in the movement vocabulary more fully. Querin is a stunning performer and captivated the audience with her candor and expression. It was a joy watching her dance as she performed the intent of the movement with clarity and nuance. While not all of her company members shared such rich performance technique, the company as a whole was committed and connected. The featured aerialists were impressive with their strength and flexibility. The challenge for a dancer to be both strong on the silks and grounded in the modern dance phrases is a tall order for any single individual. However, Acts of Affordable Care marks the strongest fusion of aerial and modern dance I have seen by the company to date. One particularly stunning fusion moment occurred in a duet between Zachary Garcia and Nicholle Debbas. Garcia and Debbas used the silks to augment the emotionally taxing aspect of care, pushing and pulling the silks in a dramatic portrayal of yearning, struggle and eventually lost connection. This short sequence was breathtakingly exciting as Debbas sailed desperately in the air. The performers were fully invested physically and emotionally, creating a special moment that blended the values of modern dance performance with the unique properties of aerial silks. The show as a whole was well received and thought provoking. While some of the imagery was perhaps a bit obscure for a general audience, the theme was clear and the piece as a whole was passionately performed. The large cast of dancers performed with intensity and connection. Returning company members Hannah Cavallaro and Jackie Aldern performed beautifully alongside newer additions including Rudy Teran and Rebecca Sano, demonstrating the thriving nature of this company and its promising future. If and When is a performance duo that presented their sketch comedy and variety show, An Awkward Sensation. Created and performed by Alison Daniels and Kurt Bodden, this delightful performance was as endearing as it was outright hysterical. Daniels and Bodden have impeccable timing and sensitivity for physical expression. Their humor is largely driven by their physicality, creating sketches that lasted from ten minutes to ten seconds. Their clarity in execution was always present and always kept me wanting more. They are both able to morph their bodies into various characters and animals with ease, from sea horses to cockroaches. Being a choreographer/dancer, a highlight of the show for me was a spectacular ballet duet– in which Bodden wore his tutu with outrageous conviction and flare. But, the show had its sensitive moments as well, in which we caught a glimpse of the fragility of the human condition. These touching sketches balanced the show beautifully and allowed for the pace of the show to rise and fall like a wave carrying us through the hour-long performance. The addition of the puppetry by Daniels also added a depth to the performance as her puppets took on a life of their own, effectively adding to the stage additional characters who quickly won hearts of the audience. An Awkward Sensation is a one of a kind show. It embodies the essence of the independent art spirit, taking risks and leading the audience on a wild ride. This is more than just well crafted entertainment; the frivolous and the profound each have a place at the table. An Awkward Sensation is a brilliant blend of art and entertainment for theater and movement lovers alike. Another concert dance group here at the Rogue is Juxtaposition Dance from Irvine California. Performed by artistic director/choreographer Nahyr Galaz and dancer Anne Carr, Dancing with Plato is a sweet story of a young girl who finds herself crushing hard on her philosophy professor before being crushed by her own unrequited emotions. Galaz has a knack for humor and poetic wordplay. She integrates both into this hour-long show that featured Carr as the dreamy lovesick girl in battle with her more logical side (played by Galaz). Set to flirty tangos, Carr performed the material with ease and fluidity. Carr has a solid, classical dance foundation that she weaves in and out of her over-the-top comedic character moments. In contrast, Galaz is a less fluid performer technically, but a powerhouse in understated comedy. They were an unlikely pair that worked well with each other. 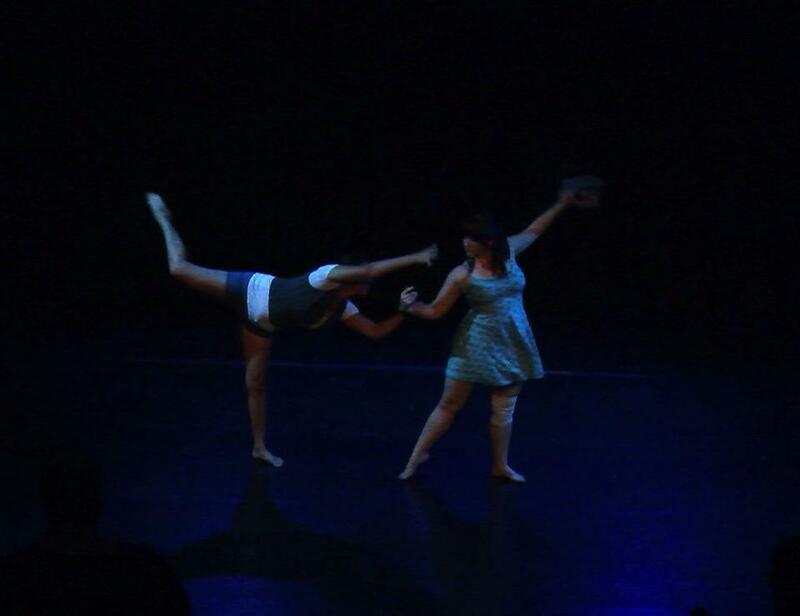 Unfortunately the lighting in the space was difficult for dance, leaving a large dark spot in the center of the stage. The performers moved throughout the space quite a bit and often found themselves in the center dark spot for extended periods of time. All of the poetry breaks were performed in this area, unfortunately causing the choreographed moments of the show to out weigh the verbal monologues, thus creating an imbalance between the dreamer and logician. The choreography had a number of beautiful moments, but overall lacked movement generation, especially for a show dominated by solos. Nevertheless, the multiple solos performed by Carr were well executed with dynamic energy and playful undertones that successfully kept the material interesting and quite funny. Juxtaposition Dance Theatre clearly has a vision for making concert dance and continuing the practice of dance as an art form rich in investigation, exploration and play. Galaz has a sharp intellect and unique perspective that serve her in her creative process, leading me to believe that this is just the beginning of her journey as a dance maker in Southern California.